Macy's Offers Free Merchandise to Lure Holiday Buyers (NYSE: M) - 24/7 Wall St. The nation’s largest retailers have begun to announce their efforts to pull in customers this holiday season. These initiatives run from free shipping to longer hours over the Black Friday weekend. Macy’s Inc. (NYSE: M) has among the most aggressive plans that include offering free merchandise. The only catch is that buyers will need to fill in a mail-in rebate. BestBlackFriday.com keeps track of advertisements and store hours from major retailers. 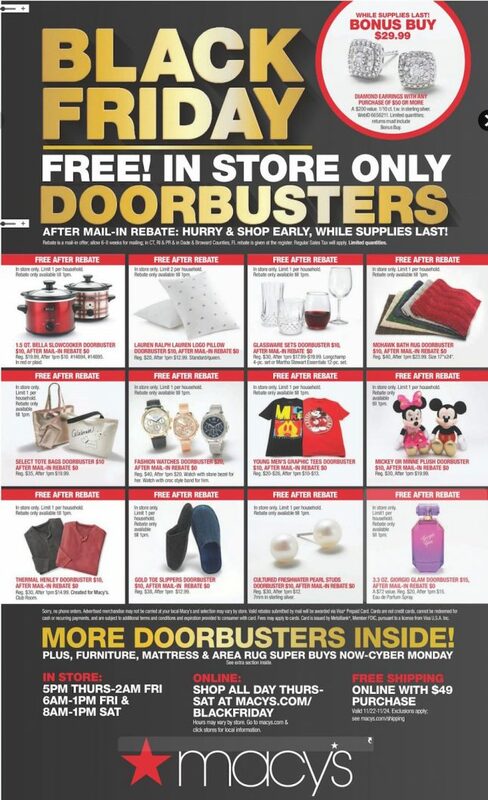 It has gotten a copy of Macy’s promotions and one of its newspaper ads, and it posted the ad online earlier today. The ads highlight 12 free products. Each carries a retail price of $10. The items on sale are available until 1 p.m. on Black Friday. Macy’s will be open from 5 a.m. Thanksgiving until 2 a.m. Black Friday. It will reopen on Black Friday at 6 a.m. The items are only available in stores. Each customer can only buy one. Once the coupon is mailed in, Macy’s says it will take six to eight weeks to get the credit. Customers will have to pay sales tax on the items. Each of the items is a “doorbuster,” a term retailers use for inventory on sale for a brief time immediately after stores open. The 12 free items are a 1.5 quart slow cooker from appliance company Bella, a Ralph Lauren logo pillow, glassware from either Martha Stewart Essentials or Longchamp, a Mohawk bath rug, a selection of tote bags, several fashion watches, Mickey or Minnie plush toys from Disney, thermal underwear, a pair of gold-toed slippers, cultured freshwater pearl studs, graphic T-shirts made for young men and a 3.3-ounce bottle of Giorgio perfume. Macy’s also will offer another set of sharp discounts. On some items that cost $25 or more, it has $10 mail-in rebates, in addition to $20 discounts on some items with price tags over $50. These discounts are available in both stores and online. However, to get the rebates in stores shoppers will need to buy them between 5 p.m. Thanksgiving and 2 a.m. on Black Friday, between 6 a.m. and 1 p.m. on Black Friday, and 8 a.m. and 1 p.m. on Saturday. These kinds of discounts and the limited times they are available are part of the array of marketing methods retailers deploy at the traditional start of the holiday season. The retailers gamble that buyers will pick up other items when they visit stores or go online. They are “loss leaders” meant to get market share and capture sales before customers buy the same or similar items from competitors. As brick-and-mortar retailers downsize and sometimes fold, market share becomes essential to performance or even survival. Macy’s has taken a step beyond free shipping and deep discounts. Its management believes “free” is a key to Thanksgiving and Black Friday traffic.